Maneuvering your boat around the racecourse in champagne sailing conditions is one thing, but is your team ready for a big breeze and big wave event? These exact conditions crowned the winners of the 2018 New York Yacht Club Race Week. Quantum’s Dave MacMillan recaps the event and shares resources to help you and your team build big breeze confidence. Killin' Waves - Austin & Gwen Fragomen's Interlodge IV successfully battles waves at the 2018 Rolex NYYC Race Week. Photo ©ROLEX/Daniel Forster. The 2018 New York Yacht Club Race Week at Newport provided classic racing conditions in Newport in July. The New York Yacht Club once again put on a world class event and credit should be given to the Organizing Committee and Race Committee for hosting a clean, well-run regatta. The weather provided a great week of racing and allowed for far more races than may have been originally anticipated with the forecast in the days leading up to the event. While there were periods of light air sailing, winds from the south prevailed at a steady 10-12 knots each day. Most fleets took part in racing that combined windward/leeward courses with a distance race, and the conditions inside Narragansett Bay offered typical flat water sailing, while outside courses provided for much choppier conditions. By and large the teams that earned their way to the podium consistently focused on as many details as possible early each day. The weather forecast and proper rig tune proved to be the most significant factors. This was particularly important for boats racing outside as factoring in the impact of sea state was critical. The top performing boats anticipated this factor with success as it related to rig tune and communication between drivers and trimmers while racing. Additionally, situational practice was a theme consistent among the top performers. Many of these programs began prepping for Race Week well in advance of the regatta and were early to the course each day for situational drills. The top performing teams did not necessarily outperform because their tactics were superior, rather, their attention to speed and minimizing mistakes with boat handling offered the best pathway to success. As noted earlier, sea state ended up being an important factor during Race Week, particularly for the IRC boats racing outside. When sailing downwind, attention to wave angle and pressure, combined with subtle steering, allowed for the top performing teams to prevail. The teams that maintained steadiness with wave angle, and avoided the temptation to 'chase' pressure and subsequently lose their lane, made significant gains downwind and with overall performance. Click here to leran more about managing waves downwind. 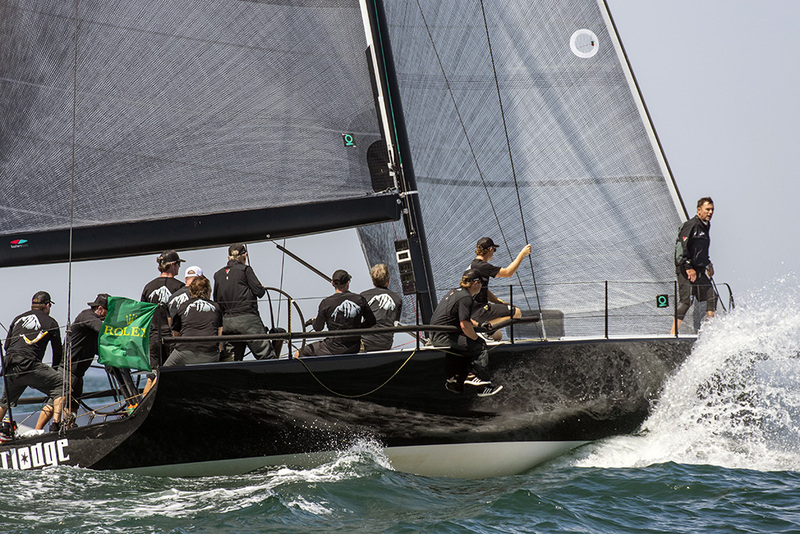 Race Week at Newport provided a wonderful opportunity to compete with some of the best sailors and programs from around the country in a fair, well-run regatta. We're honored that we were able to support so many of the teams that have chosen Quantum as a partner in their sailing and we were thrilled to see the performance of these teams across the board. Congratulations to all the competitors, especially these podium winners. View the full results here.